By James A. Leow, Graduate Student, Department of Spanish & Portuguese, The Ohio State University. Imagine you’re a parent living in a rural farming community in the mountains. You have land, and you have a house constructed with cinder blocks and sheets of corrugated metal. You pay very little for electricity, and perhaps most importantly, you have food and water. Your car is rusted, but it works well enough to get you into the town center once a week, and your children are guaranteed a middle school education because the government pays for it. Up the mountain a bit there is another family. Their house is constructed of bricks and lumber, complete with indoor plumbing that allows them to take a hot shower every evening. Their children walk the streets wearing new clothes, and a new pickup truck appeared in their yard a few years ago. The matriarch of the family suffers from Parkinson’s disease, but fortunately, they have the money to pay for her medication. The oldest daughter has moved to the city to attend college and her younger siblings are starting high school. You are grateful for what you have: a full belly and a warm heart. But you can’t help but think that your children could be better off. If you had the means, they could go to school and find a job that would allow them to make decent money. Money that would allow them to afford new clothes and a house with plumbing. Money that would keep them from having to choose between cheese and salt on the one hand, and anemia medication on the other. What’s the difference between you and the family up the mountain? They’ve gone to the United States to work as field laborers, and you’ve lived in your home town in the Mixteca Region of Oaxaca for your entire life. 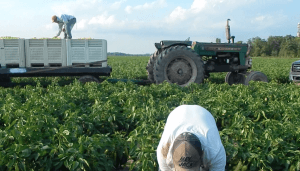 Field Labor in Ohio: This is a picture that the author took on a pepper field during the summer of 2016. I started fieldwork in the summer of 2016 in migrant camps of Northwest Ohio. I was working on my Master’s research in Hispanic Linguistics, and I was interested in how identity and the understanding of community were reflected in the language of agricultural migrant farmworkers, who are primarily Mexican immigrants and their families. While my research had its own story to tell, there was another story that rang through every interview, every entry of field notes, and every conversation off the record: we—migrant workers—are human, we are here to better the lives of our families, and we deserve to be here. With the impending presidential election and Trump’s disturbing characterization of Mexican immigrants echoing through the news and social media, many of the community members were quick to ask who I’d be voting for: Was I for them or against them? And as I decided that I would tell their story, I decided that I needed to know the other side of their story. 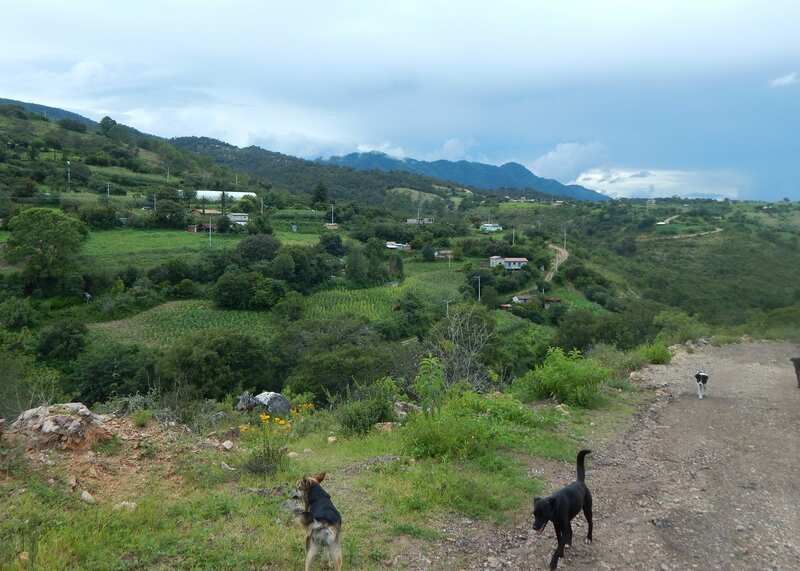 With the Global Mobility Grant, I traveled to the Mixteca Region of Oaxaca, Mexico. I spent two months in the summer of 2017 learning Mixtec, the native language of many of the migrant workers whom I met, and doing fieldwork in their hometown. A town in the Mixteca: This is a picture that the author took while abroad in the summer of 2017 in the hometown of the migrant workers that he met in Ohio. There I learned that there was food, but little money. Blue barrels full of corn could feed a family, their chickens, pig, and dogs for two years, but that same family could not afford medicine. Some had lived in the United States and decided that the strenuous life of field labor was not worth it. Others told me that they would be back in the U.S. as soon as they could manage. Families were separated by thousands of miles and a border that was becoming more impenetrable with rising xenophobia in the U.S. Traveling to the United States wasn’t the fulfillment of an “American” dream; it was a choice and a sacrifice. Parents left their homeland—a gorgeous homeland—to give their children the opportunity for a better life. Many community leaders lamented that immigration came at a cultural sacrifice: the youngest generation was not learning Mixtec; they were not learning the values of the Mixtecos. But everyone acknowledged that their town and migrant farmworker communities in the United States were inextricably tied together culturally, linguistically, economically, and politically. The stories of migrant farmworkers in the United State are complex and don’t always fit neatly into the narratives that circulate widely. Most importantly, migrant workers in the United States are human beings who have parents and grandparents and children. The individuals who I met that first summer of fieldwork have homelands outside of the U.S. and miss the food and flavors that are only grown there. They have fond memories of festivals back home where alcohol is plentiful and brass bands fill the streets. They cherish the news of their old neighbor’s son graduating the third grade. They dream that their children can have a better life than they did, and they make great sacrifices to make that dream come true. Posted by Randall Rowe at 6:15pm Posted in Uncategorized. Bookmark the permalink.